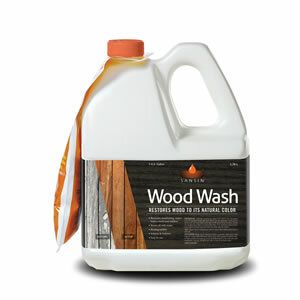 Sansin Wood Wash: Restore the natural tones of your wood surface. Restore the natural tones of your wood surface. When it comes to restoring the natural color of even the most damaged and weather-beaten wood surfaces, Sansin Wood Wash will get the job done. Wood Wash is highly effective in removing unsightly weathering, mold, algæ, mildew, staining and extreme oil and grease – and it works fast. Simply spray your wood surface, allow to sit for up to 20 minutes, rinse off and let dry. Then apply the attached package of Sansin Wood Lightener – and watch as the beautiful natural color of your wood emerges as it dries. Sansin Wood Wash is also available in 5 gallon pails of concentrated formula, dilutable with water. View the Wood Wash Product Data Sheet (PDF) for information about application, preparation, maintenance, and more. View the Wood Wash Safety Data Sheet (PDF). Sansin Dec: Deep penetrating two-coat protection. Sansin Multi-Wash: Biodegradable cleaning for practically any surface. Sansin Boracol: Diffusable long-term decay, insect and mold protection. Sansin Timber-Tec: Industrial-strength wood treatment for in-yard protection.